Welcome back friends, hobbyists and enthusiasts! We were taking a break from the blog over the holidays, but we’re back on track now with our ongoing blog series aimed at helping you get better photos with your phone. So far, if you’ve been following along, you’re probably starting to get some pretty good shots! I I know, you’re not trying to be a pro, you just want to get better at this so you, your family, friends can enjoy the pictures you take more. But, this is a good moment to pause. If you’re finding after these last couple of months that you’re enjoying this more than you expected, and maybe you do want to take this a little more seriously than you thought, shoot us a tweet or find us on Facebook and let me know! Okay, back on track. With this installment, we’re going to look at one of the more elusive skills that one both learns in order to get good at photography, and which photography itself teaches in return: Patience. Now, I’ll admit, we’re straying from the immediate scope of this series a little bit this time. Patience, after all, is a foundational skill in a lot of things. But, while I’m tempted to trust that my readers understand the importance of this skill, it’s probably the leading cause of people abandoning their enthusiasm for photography. So, address it we shall. Patience has been a stumbling block for many-a-hopeful photographer since the beginning. After all, photography started as a highly technical and relatively tedious skill, and gradually got less and less so until today when taking a photo is just a reach into the pocket away. In fact, when people think about photography in the past, most just think of someone operating this monstrous machine and going through the dreadfully long and complicated developing process. Surely all that took patience. But, that’s not all those photographers were doing. They were waiting—for the sun to hit a hill just right. They were waiting—for just the right people to walk by. They were waiting for the right moment when everything they wanted would be in the frame. While the machines that capture our images today would look like alien technology to history’s photographers, the processes through which our images are brought to life would look much more familiar. In the context of so much of our day-to-day photography, patience often just means keeping an image you want to take on your mind. As you scroll through your Facebook or Instagram feeds, you might notice photos from friends and family and think, “I wish I had thought to take pictures like this…”. The time between this thought and the next time you have a chance to take that photo is where patience is required. It requires some energy to ‘keep something in mind’; you have to keep from discarding the thought, while waiting for an opportunity to come along. I suggest keeping a simple notepad on your phone with a running list of photos you’d like to take. But, if that’s too much, just pausing for a moment and intending to take the photo next time may do the trick. 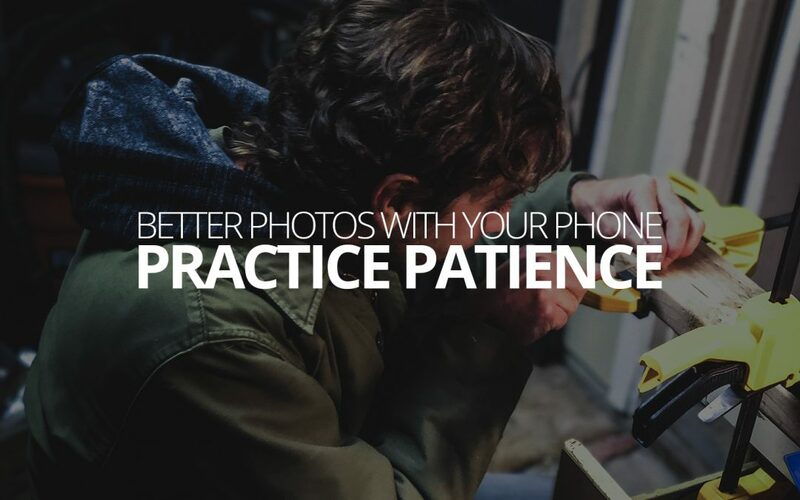 This isn’t the only need for patience you’re going to meet though, if you want to take better photos; with your phone or otherwise. For example, if you’re going to make the kids all get together in a photo, should you do it before the soccer game, or after? Or, if you’re going on vacation, should you go on the hike now, or later when the sun is hitting the lake just right? If you want your photos to be better, using patience like it’s a tool lets you pick when the photo will look the best—as long as you’ve decided to take that photo. Once you decide, patience must begin. The fact of the matter is, sometimes the photo you want can’t be taken at this exact moment. If you want your photos to look better, sometimes waiting is the only option. Photography, not unlike pretty much all other skills, also requires a kind of meta-patience as well. You won’t be good at this overnight, and you have to be okay with that, but keep being intentional to get better at it anyway. Most people who try new things give up trying those things before they get good at them, or even really get to appreciate the deeper benefits. There’s nothing wrong with that, of course. But, it is disheartening and perhaps dings our self-confidence a bit when we don’t follow through with our sincere intentions. If you sincerely wish to improve your photography, even a little bit, you have to keep up the practice. You should feel proud of yourself when you take a photo you like, and you should try again when you take a photo you don’t like. Take your time. Do a little tiny bit every day. Practice thinking about your intentions, and be patient while you wait for the right moment in the world to meet the right moment in yourself. It’s a new year, and you can do this! Practice patience with yourself.